Yay . . . double digits! The old image had to go because Facebook will not promote a post that contains more than 20% text (letters or numbers). 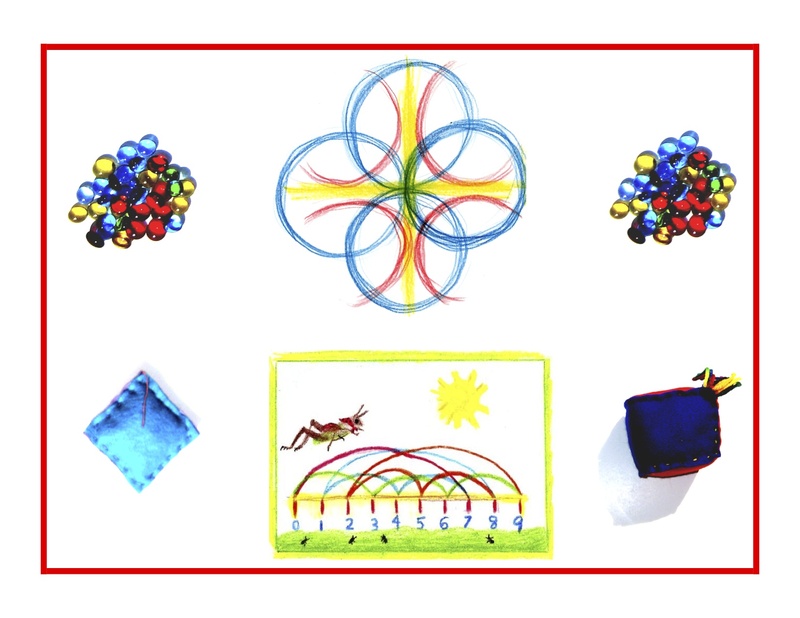 The new image includes several Math By Hand features: glass counting gems, a second grade form drawing, beanbags, and a fable-inspired times tables pattern. Why ambient? A math teaching style that’s whole and all encompassing, with themes that repeat many times through the years, is most likely to be effective and successful. Today’s blog will focus on Kindergarten Standard 4, in Operations and Algebraic Thinking. Note that the Common Core Standards will appear in blue, followed by an ambient translation. 4. For any number from 1 to 9, find the number that makes 10 when added to the given number, e.g., by using objects or drawings, and recvord the answer with a drawing or equation. The numbers will be shown with knots today. You’ll need to have several lengths of thick rope or strips of soft fabric like thin cotton or silk on hand. First, a knot-tying lesson. A picture is worth a thousand words, and this is most especially true for a young child. So, teach tying a simple overhand knot (it looks like a pretzel) with this story. “Peter Rabbit was so hungry for Mr McGregor’s lettuces, cabbages, and carrots that he didn’t think about how he was caught last time. He looked for a hole in the fence.” (Create the fence hole by placing the end over the rope). “Then he stuck his quivering rabbit nose right through the hole and dashed into the garden!” (Insert the end through the hole and pull). Cover the 1 knot with a cloth and count the remaining 9 with the child(ren). Repeat this with the other combinations that total 10. Have the child(ren) touch the knots as they count them. Afterwards, the child(ren) can tie more knots in the smaller pieces of rope, counting as they tie them. The tying itself is a wonderful way to enhance dexterity, eye-hand coordination, and small motor skills. Do a very simple crayon drawing with the child(ren) to illustrate this activity. Knowledge ensues in an environment dedicated to imaginative, creative knowing, where student and teacher alike surrender to the ensuing of that knowledge as a worthy goal. More Kindergarten tomorrow!